Peel and dice onion and potatoes. Heat olive oil in a large pot over medium heat and fry diced onion until translucent. Add diced potatoes and fry for approx. 3 – 4 min. Add half of the vegetable broth and soy cream and stir to combine. Let the mixture simmer over medium-low heat for approx. 20 min., or until the potatoes are soft. Blend the soup until it’s smooth, then add the remaining vegetable broth and horseradish, and stir to combine. Season with salt and pepper to taste. Roughly chop radicchio. Heat vegetable oil in a frying pan over medium heat and fry radicchio until golden brown. Season with salt to taste. 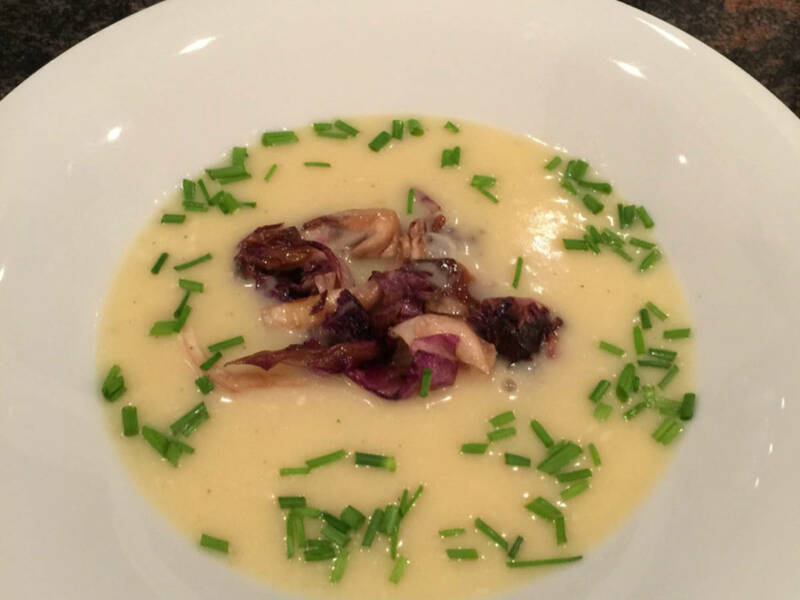 Serve hot potato soup in bowls with fried radicchio and freshly chopped chives. Enjoy!